Well, it’s sweet to see to see singers Drake and Nikki Minaj, both of the “Young Money” clan of rap/soul music, making concrete plans to solidify their connection(s). 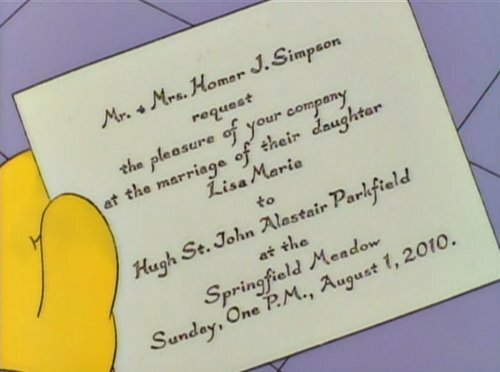 Did you all remember to RSVP for the Lisa Simpson Wedding to Hugh St. John Alastair Parkfield? Wow… are you trying to tell me that somewhere in all the glam and glitter and Air Force patrolled “no fly zone” of the Chelsea Clinton wedding, and the inevitable tired piano stylings of the Alicia Keys marriage going on, as well as , no doubt, a few other celebrity knot-tyings, that we all almost forgot the errie predictions in an old The Simpsons 6th Season episode that Lisa Simpson’s wedding was set for today? Wow. Just… just, wow. First one in the e-audience to say “Duh-Oh!” gets a virtual Farmbville brick bounced off their cyber-skull. Of course, in the daydream, Lisa is a 23 year old college student, so clearly the show has some real-time parallels to catch up on. Last time I checked, even in Season 21, she’s still in grade school. Don’t worry Lisa, Peter Parker had the same problem for years, but they finally rectified it long enough for him to be married to M.J. until a forced deal with Mephisto over Aunt May’s soul caused them both to forget they ever knew each other. Or some such nonsense. My point, to everyone else, is that the Lisa Simpson Wedding not happening on the foretold day, might not be that bad a thing either. You still have time Lisa, you still have time.